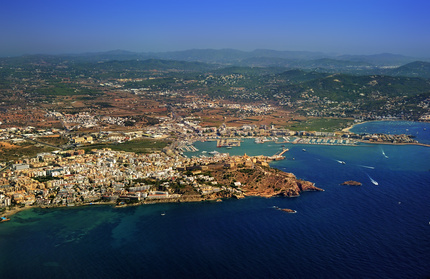 Monarch Air Group provides private air charter in Ibiza, Spain. Our clients benefit from top-notch service, unrelenting dedication to safety, wide selection of aircraft, and years of experience in chartering private jets. To obtain a free quote, please use our online quoting tool provided below, or call toll free 1-877-281-3051. Monarch Air Group provides private jet charter flights in and out of Ibiza, Spain. Situated 79 km off the city of Valencia in Iberian Peninsula, Ibiza is one of the Balearic Islands in the Mediterranean Sea. Nicknamed “White Island”, Ibiza is a famous tourist destination with its sunny beaches, vibrant nightlife, and picturesque mountains. There are more than fifty beautiful beaches, amazing watersports and outdoor activities such as waterskiing, scuba diving, jet skiing, windsurfing, sailing, parasailing, horse riding, cruising, and mountain biking. The most notable tourist attractions are La Salinas Salt Flats, Can Marca Caves, and Hippy Markets. With a blend of sunny beaches, vibrant nightlife, rich heritage and history, Ibiza attracts both business and leisure travelers from all over the world. 1. IBZ, Ibiza, Ibiza, Spain. 1. Mirador De Dalt Vila, Plaça d’Espanya, 4, Ibiza Town. 2. Hotel Garbi Ibiza & Spa****, Playa den Bossa, Calle de la Murtra, 5, San Jorge – Ibiza. 3. Hotel THB Los Molinos, Carrer de Ramon Muntaner, 60, Ibiza Town. 4. Casino De Ibiza, Paseo Juan Carlos I, 17, Ibiza Town. 5. Mirador De Dalt Vila, Plaça d’Espanya, 4, Ibiza Town. 6. Tropical Garden Apartments Ibiza Island, C/ RAMÓN MUNTANER, 44, Ibiza Town. 7. Algarb, Avgda Pere Matutes Noguera, 92, Ibiza Town. 8. Hotel Garbi Ibiza & Spa****, Playa den Bossa, Calle de la Murtra, 5, San Jorge – Ibiza. 9. Sirenis Hotel Goleta & Spa, Avinguda de Pere Matutes Noguera, 7, Ibiza Town. 10. Hotel THB Los Molinos, Carrer de Ramon Muntaner, 60, Ibiza Town.